If you created your AWS account before 2013-12-04, you might have support for EC2-Classic in some regions. Some Amazon EC2 resources and features, such as enhanced networking and newer instance types, require a virtual private cloud (VPC). Some resources can be shared between EC2-Classic and a VPC, while some can't. For more information, see Sharing and Accessing Resources Between EC2-Classic and a VPC. If your account supports EC2-Classic, you might have set up resources for use in EC2-Classic. If you want to migrate from EC2-Classic to a VPC, you must recreate those resources in your VPC. There are two ways of migrating to a VPC. You can do a full migration, or you can do an incremental migration over time. The method you choose depends on the size and complexity of your application in EC2-Classic. For example, if your application consists of one or two instances running a static website, and you can afford a short period of downtime, you can do a full migration. If you have a multi-tier application with processes that cannot be interrupted, you can do an incremental migration using ClassicLink. This allows you to transfer functionality one component at a time until your application is running fully in your VPC. If you need to migrate a Linux instance, see Migrating a Linux Instance from EC2-Classic to a VPC in the Amazon EC2 User Guide for Linux Instances. Complete the following tasks to fully migrate your application from EC2-Classic to a VPC. Your AWS account comes with a default VPC in each region, which is ready for you to use. Instances that you launch are by default launched into this VPC, unless you specify otherwise. For more information about your default VPC, see Your Default VPC and Subnets. Use this option if you'd prefer not to set up a VPC yourself, or if you do not need specific requirements for your VPC configuration. In your existing AWS account, open the Amazon VPC console and use the VPC wizard to create a new VPC. For more information, see Scenarios for Amazon VPC. Use this option if you want to set up a VPC quickly in your existing EC2-Classic account, using one of the available configuration sets in the wizard. You'll specify this VPC each time you launch an instance. In your existing AWS account, open the Amazon VPC console and set up the components of a VPC according to your requirements. For more information, see Your VPC and Subnets. Use this option if you have specific requirements for your VPC, such as a particular number of subnets. You'll specify this VPC each time you launch an instance. You cannot use the same security groups between EC2-Classic and a VPC. However, if you want your instances in your VPC to have the same security group rules as your EC2-Classic instances, you can use the Amazon EC2 console to copy your existing EC2-Classic security group rules to a new VPC security group. You can only copy security group rules to a new security group in the same AWS account in the same region. If you've created a new AWS account, you cannot use this method to copy your existing security group rules to your new account. You'll have to create a new security group, and add the rules yourself. For more information about creating a new security group, see Amazon EC2 Security Groups for Windows Instances. Select the security group that's associated with your EC2-Classic instance, then choose Actions and select Copy to new. In the Create Security Group dialog box, specify a name and description for your new security group. Select your VPC from the VPC list. The Inbound tab is populated with the rules from your EC2-Classic security group. You can modify the rules as required. In the Outbound tab, a rule that allows all outbound traffic has automatically been created for you. For more information about modifying security group rules, see Amazon EC2 Security Groups for Windows Instances. If you've defined a rule in your EC2-Classic security group that references another security group, you will not be able to use the same rule in your VPC security group. Modify the rule to reference a security group in the same VPC. An AMI is a template for launching your instance. You can create your own AMI based on an existing EC2-Classic instance, then use that AMI to launch instances into your VPC. You can create an Amazon EBS volume and use it to back up and store the data on your instance—like you would use a physical hard drive. Amazon EBS volumes can be attached and detached from any instance in the same Availability Zone. You can detach a volume from your instance in EC2-Classic, and attach it to a new instance that you launch into your VPC in the same Availability Zone. After you've created an AMI, you can launch an instance into your VPC. The instance will have the same data and configurations as your existing EC2-Classic instance. You can either launch your instance into a VPC that you've created in your existing account, or into a new, VPC-only AWS account. You can use the Amazon EC2 launch wizard to launch an instance into your VPC. On the Choose an Amazon Machine Image page, select the My AMIs category, and select the AMI you created. On the Choose an Instance Type page, select the type of instance, and choose Next: Configure Instance Details. On the Configure Instance Details page, select your VPC from the Network list. Select the required subnet from the Subnet list. Configure any other details you require, then go through the next pages of the wizard until you reach the Configure Security Group page. Select Select an existing group, and select the security group you created earlier. Choose Review and Launch. Review your instance details, then choose Launch to specify a key pair and launch your instance. For more information about the parameters you can configure in each step of the wizard, see Launching an Instance Using the Launch Instance Wizard. To launch an instance in your new AWS account, you'll first have to share the AMI you created with your new account. You can then use the Amazon EC2 launch wizard to launch an instance into your default VPC. Switch to the account in which you created your AMI. In the Filter list, ensure Owned by me is selected, then select your AMI. In the Permissions tab, choose Edit. Enter the account number of your new AWS account, choose Add Permission, and then choose Save. Switch to your new AWS account. In the Filter list, select Private images. Select the AMI that you shared from your EC2-Classic account, then choose Launch. On the Configure Instance Details page, your default VPC should be selected in the Network list. Configure any other details you require, then go through the next pages of the wizard until you reach the Configure Security Group page. In this example, you use AWS to host your gardening website. To manage your website, you have three running instances in EC2-Classic. Instances A and B host your public-facing web application, and you use Elastic Load Balancing to load balance the traffic between these instances. You've assigned Elastic IP addresses to instances A and B so that you have static IP addresses for configuration and administration tasks on those instances. Instance C holds your MySQL database for your website. You've registered the domain name www.garden.example.com, and you've used Route 53 to create a hosted zone with an alias record set that's associated with the DNS name of your load balancer. The first part of migrating to a VPC is deciding what kind of VPC architecture will suit your needs. In this case, you've decided on the following: one public subnet for your web servers, and one private subnet for your database server. As your website grows, you can add more web servers and database servers to your subnets. By default, instances in the private subnet cannot access the Internet; however, you can enable Internet access through a Network Address Translation (NAT) device in the public subnet. You may want to set up a NAT device to support periodic updates and patches from the Internet for your database server. You'll migrate your Elastic IP addresses to a VPC, and create a load balancer in your public subnet to load balance the traffic between your web servers. Create a VPC: In this case, you can use the VPC wizard in the Amazon VPC console to create your VPC and subnets. The second wizard configuration creates a VPC with one private and one public subnet, and launches and configures a NAT device in your public subnet for you. 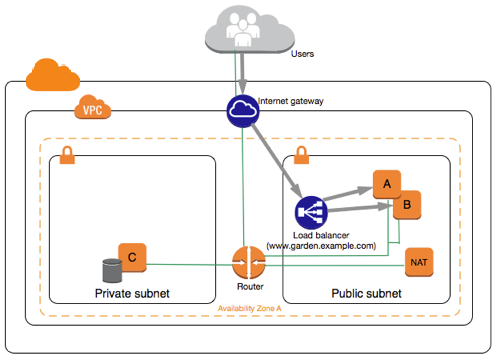 For more information, see Scenario 2: VPC with Public and Private Subnets in the Amazon VPC User Guide. Create AMIs from your instances: Create an AMI from one of your web servers, and a second AMI from your database server. For more information, see Step 3: Create an AMI from Your EC2-Classic Instance. Configure your security groups: In your EC2-Classic environment, you have one security group for your web servers, and another security group for your database server. You can use the Amazon EC2 console to copy the rules from each security group into new security groups for your VPC. For more information, see Step 2: Configure Your Security Group. Create the security groups that are referenced by other security groups first. Launch an instance into your new VPC: Launch replacement web servers into your public subnet, and launch your replacement database server into your private subnet. For more information, see Step 4: Launch an Instance Into Your VPC. Configure your NAT device: If you are using a NAT instance, you must create security group for it that allows HTTP and HTTPS traffic from your private subnet. For more information, see NAT Instances. If you are using a NAT gateway, traffic from your private subnet is automatically allowed. Configure your database: When you created an AMI from your database server in EC2-Classic, all the configuration information that was stored in that instance was copied to the AMI. You may have to connect to your new database server and update the configuration details; for example, if you configured your database to grant full read, write, and modification permissions to your web servers in EC2-Classic, you'll have to update the configuration files to grant the same permissions to your new VPC web servers instead. Configure your web servers: Your web servers will have the same configuration settings as your instances in EC2-Classic. For example, if you configured your web servers to use the database in EC2-Classic, update your web servers' configuration settings to point to your new database instance. By default, instances launched into a nondefault subnet are not assigned a public IP address, unless you specify otherwise at launch. Your new database server may not have a public IP address. In this case, you can update your web servers' configuration file to use your new database server's private DNS name. Instances in the same VPC can communicate with each other via private IP address. Migrate your Elastic IP addresses: Disassociate your Elastic IP addresses from your web servers in EC2-Classic, and then migrate them to a VPC. After you've migrated them, you can associate them with your new web servers in your VPC. For more information, see Migrating an Elastic IP Address from EC2-Classic. Create a new load balancer: To continue using Elastic Load Balancing to load balance the traffic to your instances, make sure you understand the various ways you can configure your load balancer in VPC. For more information, see Elastic Load Balancing in Amazon VPC. 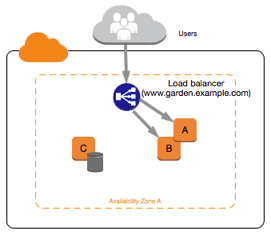 Update your DNS records: After you've set up your load balancer in your public subnet, ensure that your www.garden.example.com domain points to your new load balancer. To do this, you'll need to update your DNS records and update your alias record set in Route 53. For more information about using Route 53, see Getting Started with Route 53. Shut down your EC2-Classic resources: After you've verified that your web application is working from within the VPC architecture, you can shut down your EC2-Classic resources to stop incurring charges for them. Terminate your EC2-Classic instances, and release your EC2-Classic Elastic IP addresses. The ClassicLink feature makes it easier to manage an incremental migration to a VPC. ClassicLink allows you to link an EC2-Classic instance to a VPC in your account in the same region, allowing your new VPC resources to communicate with the EC2-Classic instance using private IPv4 addresses. You can then migrate functionality to the VPC one step at a time. This topic provides some basic steps for managing an incremental migration from EC2-Classic to a VPC. For more information about ClassicLink, see ClassicLink. To use ClassicLink effectively, you must first identify the components of your application that must be migrated to the VPC, and then confirm the order in which to migrate that functionality. For example, you have an application that relies on a presentation web server, a backend database server, and authentication logic for transactions. You may decide to start the migration process with the authentication logic, then the database server, and finally, the web server. After you've created a VPC, you can enable it for ClassicLink. For more information about ClassicLink, see ClassicLink. Select your VPC, and then select Enable ClassicLink from the Actions list. The next step in the migration process is to launch instances into your VPC so that you can start transferring functionality to them. You can use the AMIs that you created in the previous step to launch instances into your VPC. The instances will have the same data and configurations as your existing EC2-Classic instances. After you've launched your instance and it's in the running state, you can connect to it and configure it as required. After you've configured your instances and made the functionality of your application available in the VPC, you can use ClassicLink to enable private IP communication between your new VPC instances and your EC2-Classic instances. Select your EC2-Classic instance, then choose Actions, ClassicLink, and Link to VPC. Ensure that your instance is in the running state. In the dialog box, select your ClassicLink-enabled VPC (only VPCs that are enabled for ClassicLink are displayed). Depending on the size of your application and the functionality that must be migrated, repeat steps 4 to 6 until you've moved all the components of your application from EC2-Classic into your VPC. After you've enabled internal communication between the EC2-Classic and VPC instances, you must update your application to point to your migrated service in your VPC, instead of your service in the EC2-Classic platform. The exact steps for this depend on your application’s design. Generally, this includes updating your destination IP addresses to point to the IP addresses of your VPC instances instead of your EC2-Classic instances. You can migrate your Elastic IP addresses that you are currently using in the EC2-Classic platform to a VPC. For more information, see Migrating an Elastic IP Address from EC2-Classic. After you've completed this step and you've tested that the application is functioning from your VPC, you can terminate your EC2-Classic instances, and disable ClassicLink for your VPC. You can also clean up any EC2-Classic resources that you may no longer need to avoid incurring charges for them; for example, you can release Elastic IP addresses, and delete the volumes that were associated with your EC2-Classic instances.